The Skyhawk is of conventional post-WW2 design, with a low-mounted delta-like wing, tricycle undercarriage, and a single turbojet engine in the rear fuselage, with intakes on the fuselage sides. The tail is of cruciform design, with the horizontal stabilizer mounted above the fuselage. Armament consisted of two 20 mm Colt Mk 12 cannon, one in each wing root, with 200 rounds per gun, plus a large variety of bombs, rockets, and missiles carried on a hardpoint under the fuselage centreline and hardpoints under each wing (originally one per wing, later two). The design of the A-4 is a good example of the virtues of simplicity. The choice of a delta wing, for example, combined speed and maneuverability with a large fuel capacity and small overall size, thus not requiring folding wings, albeit at the expense of cruising efficiency. The leading edge slats are remarkably designed to drop automatically at the appropriate speed by gravity and air pressure, thereby not even needing motors or even a pilot switch. Similarly the main undercarriage did not penetrate the main wing spar, being mounted so that when retracted only the wheel itself was inside the wing and the undercarriage struts were housed in a fairing below the lower wing surface. This meant that the wing structure itself could be lighter for the same overall strength and combined with the lack of a (heavy) wing fold mechanism even more weight was saved. This is the exact reverse of what often happens in aircraft design where a small weight increase in one area leads to a compounding increase in weight in other areas to compensate, leading to the need for more powerful, heavier engines and so on in a tight vicious cycle. The A-4 pioneered the concept of "buddy" self air-to-air refueling. This allowed the aircraft to be used as a tanker for others of the same type, removing the need for entirely different tanker aircraft - a particular advantage for small air arms or when operating in remote locations. This worked by designating a tanker aircraft and fitting it with a centre-mounted "buddy store" that was a large external fuel tank with a hose reel in the aft section and an extensible drogue type refueling bucket. This aircraft was fuelled up without armament and launched prior to the attack aircraft. The attack aircraft were then armed up to the maximum and given only just enough fuel to bring them up to the maximum take-off weight. Once airborne, they would then proceed to top up their fuel tanks from the tanker using the A-4's inbuilt re-fuelling probe on the starboard side of the aircraft nose. They could then proceed to the target with both full armament and fuel loads. While rarely used in service since the KA-3 Skywarrior tanker was available, every Boeing, formerly McDonell Douglas F/A-18E/F Super Hornet is now built with this capability with the retirement of dedicated tankers imminent in the 2000s. The A-4 was also designed to be able to make an emergency landing, in the event of a hydraulic failure, on the two drop tanks nearly always carried by these planes. Such landings resulted in only minor damage to the nose of the aircraft which could be repaired in less than an hour. The wings had automatic leading edge slats, operated by aerodynamic pressure alone, again a simple but effective and weight saving feature. Ed Heinemann is credited with having a large "K.I.S.S." sign put up on the wall of the drawing office when the aircraft was being designed. Whether this is true, the A-4 certainly is a shining example of the application of that principle to aircraft design. This design philosophy also made the Skyhawk a most capable combat aircraft. Used in Vietnam, Israeli wars, Falklands conflict and the Gulf War, it proved that a small aircraft was able to carry a decent war load to the enemy and get the pilot back. In the US, when the Navy switched its light attack over to the A-7, the Marines did not want the larger aircraft and so an upgraded A-4, based on the Israeli A-4N was developed that became the last of the Skyhawks, the A-4M. The increased power of an updated engine and new avionics provided a more capable aircraft than their previous A-4E/F aircraft that they'd shared with the Navy. These aircraft remained in the Marine inventory until the mid 1990s when those units transitioned either to the AV-8B Harrier or the F-18 Hornet. Surplus A-4M Skyhawks have found many ready buyers in the foreign market where an easily maintained and still capable airframe is desired. Fujimi makes the finest Skyhawk family of kits that you can buy. Not often I make a statement like that, but in this case, it is true. Fortunately for us, these kits have not fallen off the face of the planet as once feared and are generally available via many of the on-line shops. 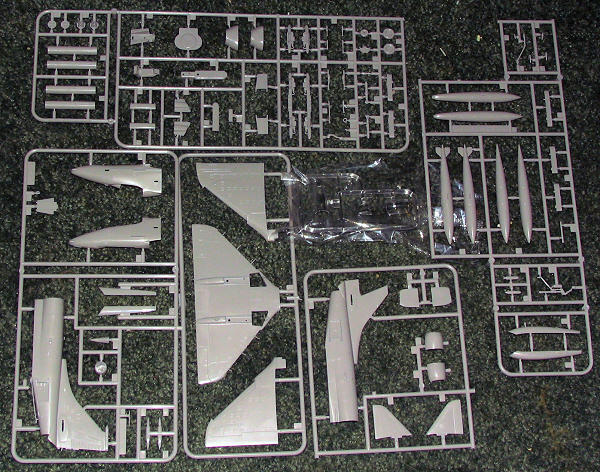 These kits are quite modular with separate nose and tail sections to allow the full family of Skyhawks to be done using as many common sprues as possible. This means a lot of bits compared to some other kits and it also means a lot of detail. Finely engraved with near scale thick clear parts, these kits will reward a careful build. Full cockpits with raised detail on the instrument panels and side consoles. Decals are provided if you wish to use those. A reasonable looking and relatively accurate seat is also provided, though a resin one will definitely add a lot to the small cockpit. The slats and flaps are separate as are the speed brakes so you can show these deployed if you wish. There are three drop tanks and a set of rocket pods to place under the wings makes for a reasonably busy load, though aftermarket weapons sets will add even more possibilities. You also have the option of a two piece or single piece canopy, though I'm sure most will opt for the former. It was brought to my attention that the kit is missing the chaff/flare dispensers at the lower rear of the fuselage. This is due to interchangeability of parts with other variants. Means you'll need to do an early version without them or find a photo-etch set that has them. Instructions are very well done with Gunze colors as the main color reference. 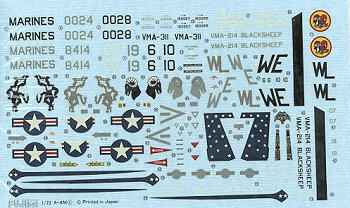 Markings are for four aircraft in the instructions, two each from VMA-311 and VMA-214. In this case you have a choice of low viz schemes for each if you want. I question the low viz insignia and the full color ones look a bit off in terms of the central star so you may wish to consider alternates. For those of you who missed these the first time around, do yourself a real favor and pick one up. You'll find it a superb build that gives you a very accurate model and will probably lead to more of the series. The internet and especially Wikipedia.